To mark the 150th anniversary of the death of Beatrix Potter (in 2016) the Royal Mint issued 5 Potter themed coins. They had absolutely no idea how popular the Peter Rabbit silver proof coin (complete with tacky colour transfer, which looks very similar to the ones you have to soak in water and apply to the fuselage of your Airfix Messerschmitt Bf109) would be. 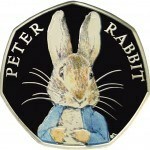 The 15,000 2016 Peter Rabbit coins sold out within hours and they were kicking themselves all the way to the bank for not giving the coin a higher mintage limit. It was beyond their wildest dreams. The subsequent Duck, Hedgehog and Squirrel silver proof coloured-in coins, well, they did less well, but unperturbed by that, this year (2017), the Royal Mint decided to mark the, erm: 151st Anniversary of Beatrix Potter’s Death with another 4 coins, despite the fact that the folders they sold for the BU packaged coin range only have 5 spaces for the 2016 coins as originally planned. 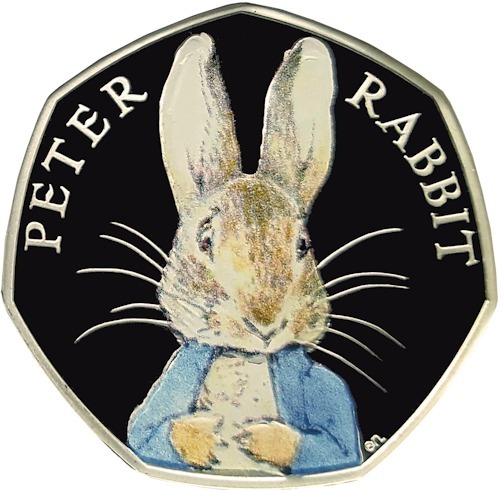 The 2017 Beatrix Potter coins were launched today, initially the ‘Tale of Peter Rabbit’ coin, which is very similar indeed, but different to the original one that sold like hot cakes, being made available – this time with a doubled maximum mintage of 30,000 and an increased price of £60 each for the silver proof version. 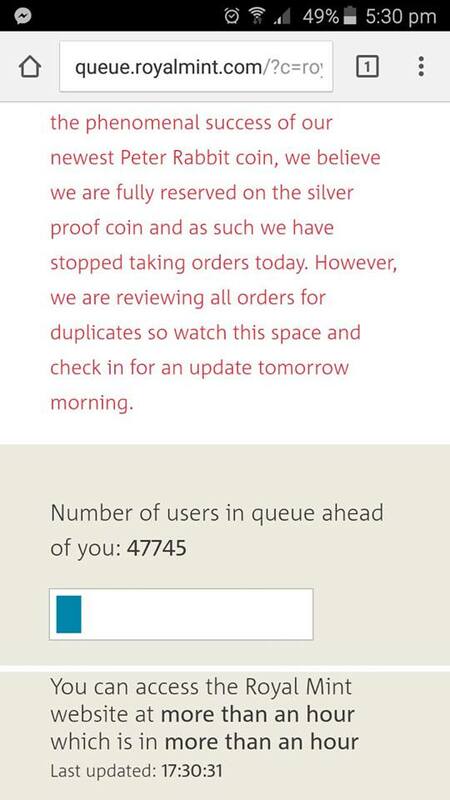 They sold out again within a few hours after implementing a queuing system on their website, where at one stage there were nearly 48,000 people waiting in the queue (I’ve seen another screenshot just now with over 82,000 people in the queue)! 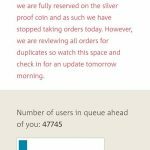 It was slow, it crashed a lot and thousands of people are still unsure as to whether their orders got through successfully. Don’t worry if you were unable to get one though, as rumour has it that only about 100 of the people that successfully bought one actually want one to keep, the rest of them all bought as many as they could (it was apparently limited to 3 per customer) and all of those coins will be appearing on eBay soon. In fact I have a feeling they probably already are, even before they’ve been received. 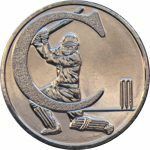 This frenzy will in turn be followed by the usual sensationalist stories in the tabloids and on click-bait websites where they will probably confuse the normal non-silver coin for the coloury silver one (again). The hype will feed the frenzy and the frenzy will feed the hype and lots of people will get caught up and end up buying one because they’re amazing, only to wonder two weeks later why on earth they bought it in the first place. Actually I’m very excited now* and really hope these coins will be made available in different packaging again, like they were last year. The standard Perspex block is all well and good, but what we really need is different packaging. I don’t mind paying a lot more for exactly the same coin in a different box. An ebony box, a cherry coloured box and something red would also be nice this year. Most of all though, I’m looking forward to seeing the same coin in a First Day Cover combination complete with a stamp on it and an envelope, just like a real letter! Is that really what coin collecting is about? Fantastic article i love your sense of humor i’m posting this on the group brilliant! « The Round Pounds are going, everybody panic!